The right choice for meaningful and economical funerals and cremations. Planning your funeral or cremation in advance makes a difficult time easier. Affordable, simple and economical alternative to traditional funeral homes. 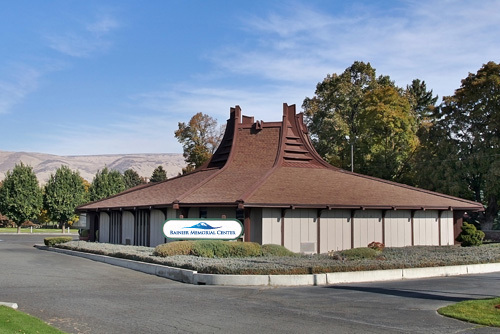 Rainier Memorial Center is an affordable, simple and economical alternative to traditional funeral homes located in Yakima, Washington. When it comes to low-cost funerals and cremations for today’s price-conscious families, Rainier Memorial Center is the one provider to trust. We at Rainier Memorial Center excel at providing compassionate care, customized to meet your needs, at an affordable cost. And, we offer the ”Rainier Guarantee”. If we are presented with a local competitor’s general price list or advertisement which has a lower price for the same goods and services, we will match or beat that price. With professional and compassionate staff, clean facilities and a low-cost guarantee, Rainier Memorial Center is the right choice for meaningful and economical funerals and cremations. Honoring the life of your loved one speaks directly to the relationship you shared. We look forward to helping you decide how best to celebrate that relationship and honor the individual you've lost. We can make suggestions that will enhance your ideas and create a fitting, memorable event and still keep within your budget. Call (509) 453-9371 for more information.